With local landscapes filling with a sea of yellow, orange and red, it’s one of the most beautiful times to get out and explore the region and take some great photos while you’re at it! So, grab your camera, bring a few friends or family and get out and experience the “unbe-leaf-able” Fall colours right in our own backyard! You don’t have to venture outside the downtown core to experience some “Insta-worthy” Fall foliage, in fact, downtown Fredericton is one of my favourite places to experience it! The bright colours on the trees lining the streets against the architecture and charm of our downtown makes for the perfect backdrop and the best part is, you stay close to all the local attractions! [Fredericton, NB] I finally found some awesome fall foliage. All I had to do was walk the streets of @downtown_fredericton. With 115km of trails, there’s no doubt Fredericton has tons of ideal photo settings and leaf-peeping opportunities to choose from within its trails alone. You can even make a pit stop along the trails to experience some of Fredericton’s favourite social gathering spots -- craft breweries! Cheers! Tip: grab a trail map and check out this list of breweries and attractions along the trails! 3. Bridge to more photo ops! You’d probably be lying if you said you didn’t take pictures on the Bill Thorpe Walking Bridge before, but as a fan favourite, I couldn’t leave it out! From the bridge you’ll see the colourful Fredericton cityscape and experience the calming surroundings of the Saint John River, you won’t even realize you’re right in the core of the city! The view from the Fredericton foot bridge - Fall edition. Capture the tantalizing heights of the hill and breathtaking city views while you allow the University of New Brunswick campus to recount the history of the oldest English-Speaking university in the country! Roam the enchanting forest, watch the seasons change right before your eyes and meet some 400+ year old trees! This is also the perfect spot for some family photos including your four-legged sidekicks! Love my little pumpkins . . . . @kenziegray13 . . . .
It’s not hard to see why this is a fan favourite place to experience to go leaf-peeping in Fredericton, with 20km of trails around the perimeter of the lake, this is the perfect place to walk the dog, go for a bike ride, run, or walk while taking in all the colours of Fall! Don’t forget to pose on the red carpet! Trail buddies. . . . .
Aside from the obvious tasty perks of choosing an orchard as your photo setting, they offer beautiful backdrops to update your family photos or get a picture with your special someone or best friends! Stop at Everett Family Orchard located on a hill providing an expansive view of the Saint John River and a Fall themed photo booth! Or head to River View Orchard for a trip to the corn maze! Tip: to find more places to go apple picking check out this list! If you’re looking to explore the greater Fredericton region, Mactaquac Provincial Park is a great starting point! With lots of greenery, a golf course, waterfront, trails, and more, you’re sure to find a picture-perfect way to document your day! or against a beautiful Fall-themed backdrop! Finish off your visit by picking up some farm fresh veggies and feeding some farm animals – a favourite among the little ones and the adults alike! 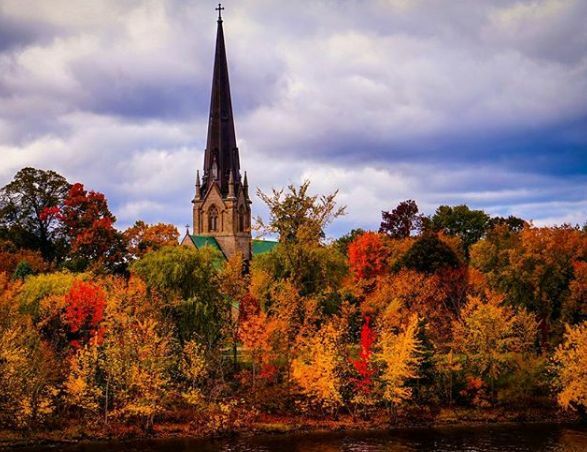 So whether you’re looking for the perfect backdrop or just looking to capture the vibrant Fredericton Fall foliage, we hope this list helps get you started down the right path! The fun doesn’t have to stop here, for more ideas of things to do in Fredericton this fall click here! We love seeing your Fall photos around Fredericton, so be sure to share them with the Fredericton Tourism team and don’t “leaf” us hanging, tell us your favourite spots to take Fall photos in Fredericton! When not behind the camera, Alexis also enjoys painting and cooking and can usually be found telling a few cheesy jokes alongside friends at UNB where she studies business.